View on lake. Staff was friendly. Location of hotel. The bed was comfy and i loved the fact that it was such a quiet place, i got relaxed and enjoyed the beach which is just 2 mins from the hotel and really really clean! The bed and linens were so comfy! 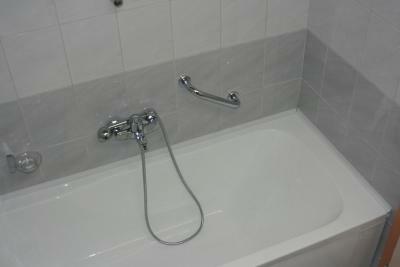 I really enjoyed the bathtub as well. Overall, it was spacious and comfortable. Разнообразие питания. Особенно чорба! Приветливые официанты! Otelin göl kenarında, havanın temiz ve sakin olması otelin en sevilen tarafı. 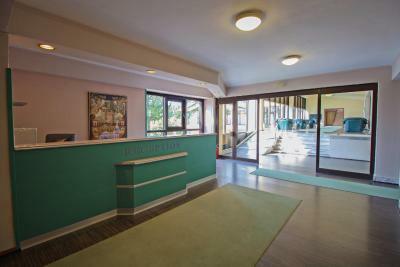 Hotel Tourist - Metropol Lake Resort This rating is a reflection of how the property compares to the industry standard when it comes to price, facilities and services available. It's based on a self-evaluation by the property. Use this rating to help choose your stay! 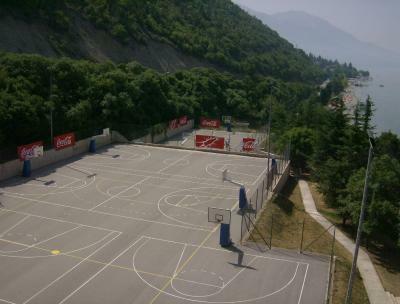 As a part of the Metropol Lake Resort, Hotel Tourist – Metropol Lake Resort in Ohrid is surrounded by the picturesque Lake Ohrid and mount Galicica, boasting numerous sports facilities. The accommodations part covers an area of 9.8 ft². 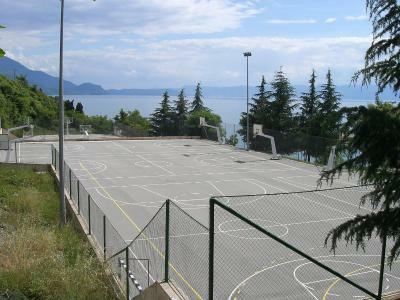 There are 5 basketball courts, 3 volleyball courts, 2 courts for soccer and 2 courts for beach volleyball. All the meals are served in the restaurant of Hotel Tourist – Metropol Lake Resort. The restaurant is 2625 ft² big and there is a beautiful spacious terrace. When would you like to stay at Hotel Tourist - Metropol Lake Resort? Spacious room offering cable TV, a desk and chair and a terrace that overlooks the mountains and the lake. 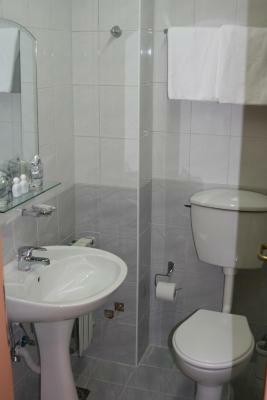 Private bathroom provides a shower and free toiletries. Hotel Tourist is opened in 1985 as ANEX to Hotel Metropol. Later it is reqistered as separate hotel building (3 starts category) and it's one of the three hotels in the "Metropol Lake Resort". Placed on the shores of the unique Ohrid Lake with own private beach, The guests can enjoy all the facilities of the Resort and many of them are free of charge: Parking, Fitness hall, Wi-Fi Internet, Pools, Sunbeds on the beach. Sauna & Massage options with surcharge. We expect your visit, so we can show you more. House Rules Hotel Tourist - Metropol Lake Resort takes special requests – add in the next step! Hotel Tourist - Metropol Lake Resort accepts these cards and reserves the right to temporarily hold an amount prior to arrival. Hotel Tourist is part of the Metropol Lake Resort consisting of Hotel Metropol, hotel Tourist and Hotel Bellevue. It is also linked with Hotel Metropol through an indoor hall. Staff wasn’t friendly, rooms are old, not very good cleaned. Maybe they need to improve a bit the design,elevator and some other facilities. Room was not clean. Repairing of room not satisfied. Not airconditoning.